Let's just say you can take the girl out of the Zumba class but you can't take the Zumba class out of the girl! Here are just two examples of what I mean. Table for Two: The evening starts off innocently enough. I promise myself that I am NOT going to talk about Zumba because the people that I am with are not Zumba enthusiasts. I get it all out of my system by listening to Zumba music while getting ready to go out and dancing around the house. On the way to pick up my friends I blare my favorite merengue and scream the words out the window at the top of my lungs. I think I have gotten it ALL out of my system. My friends get in the car and say “How are you?”….”Good” I respond with the local top 40 station softly playing in the background. I think we made it about 30 minutes before the topic of Zumba comes up. They ask how classes are going “Good Good” I say as I brush the entire topic under the table as I truly try to move on with the discussion; and then it happens at dinner. I hear a song that I MUST HAVE FOR CLASS. So I break out my phone, stand up and I hold my arm up in the air like I am saluting the ceiling in the middle of appetizers. I honestly don’t care if people are looking, or what they are thinking because I am Shazam-ing my next favorite song and all I can think about is choreography. The Night Out: After dinner it is decided among the group that everyone wants to go dancing. Hmmmm you think to yourself, dancing. “Well, I really can’t dance you blurt out”, and then it comes. The blank stare, the awkward moment of silence and the screaming “WHAT!!!?? You dance a zillion times a week”. But really have you ever tried going to a club and dancing? I don’t mean doing your best Zumba routine on the middle of the dance floor as your friends join in and follow you on queue. I mean actually dancing. I have found that is so hard making that transition from doing a Zumba routine or choreographing a new routine with Zumba steps to actually just letting loose and dancing. It is especially difficult when “your” Zumba songs comes on. I mean it is like a magnetic force trying to hold you back as you break out in a routine in the middle of the dance floor. But before you know it you do a few small steps, make a few hand gestures like you are doing the routine, you inch your way out on the dance floor, then you get a little bolder and make bigger moves and by the end of the song you and your peeps are full fledge Zumba-ing on the dancefloor. The outcome? 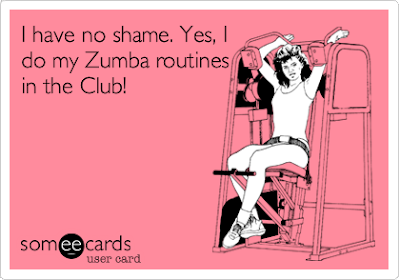 #Zumbahigh and yes you can dance, and it feels great! However, I am going to venture to say that while Zumba does encompass dancing, *most* cases you can’t substitute dancing for Zumba when you are in a club. Put that caveat in your back pocket and go for the let’s-get-the-party-started theme and get on that dance floor, start your best cumbia, bachata or merengue, and I guarantee before you know it people will be shimmying and shaking with you. Does this look familiar? Well, you don't need to really try for a zumba dance but zumba shoes will work on its way and yeah... you will definitely start dancing. Basically a girl who loves zumba dancing, you can't take her away from that but it's better if you start trying zumba. You are a beginner but a very fast learner. You are not sure if you should buy figure skates at this time. However you feel you are progressing fairly quickly. You have made it to freestyle levels. Now the big question is should you stop renting and buy your own pair of figure skates.I find this website drop foot shoes. You can visit this site.